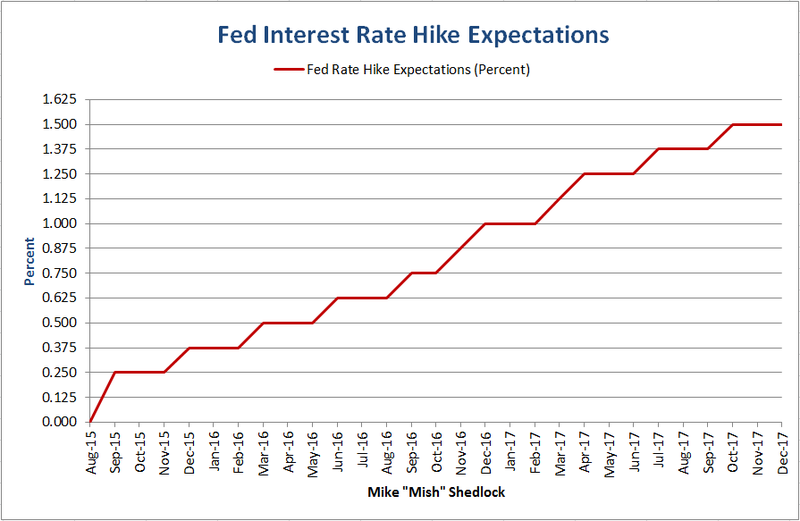 Mish's Global Economic Trend Analysis: Plotting the Fed's Baby Step 1/8 Point Hikes; Yellen vs. Greenspan "Measured Pace"
Plotting the Fed's Baby Step 1/8 Point Hikes; Yellen vs. Greenspan "Measured Pace"
The market still believes the Fed will hike rates in September or October. The CME's FedWatch Sees it like this. That table is based on Fed Fund Futures and option bets. I highly doubt the Fed will think about a half-point hike no matter how strong the economic data between now and the September 16-17 meeting. Fed Funds Futures expire on the last day of the month but settle at the average rate for 30 days prior. Using Fed Funds Futures (not options) from August 18, I generated the chart and table below. Rate hikes will not be that smooth. For starters, meetings are 8 times a year, not 12. The current Fed Funds Rate as of August 18, 2015 is 0.138 percent. 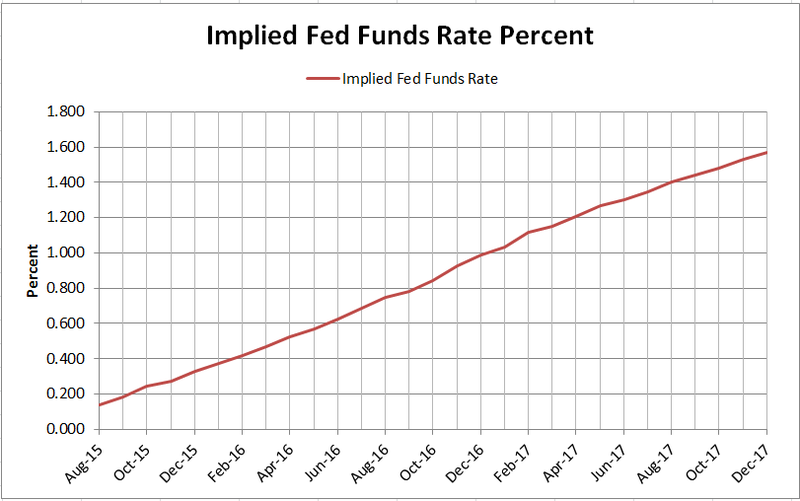 The implied rate for September is only 0.185 percent (but that is a 30-day average). 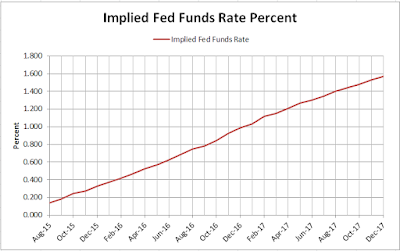 The implied rate does not hit 0.25 percent until October. That would roughly be a 1/8 point hike from the current rate of 0.138 percent. 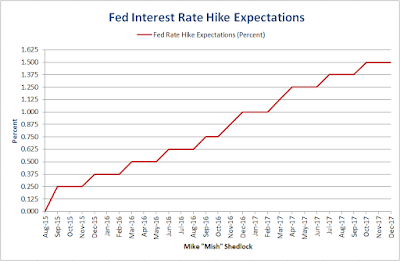 The next 1/8 point hike would not occur until December or January at the earliest. Let's assume the Fed actually does get a hike off in September if for no other reason than the market expects such a hike. Based on Fed Fund Futures and FOMC Meeting Dates, and taking into account 30-day averages, the table of future rate hikes looks something like this. Fed Funds Futures strongly suggest the Fed will move to 1/8 point hikes, down from current moves of 1/4 point or more, and widely spaced at that. Taking into account FOMC meeting dates, I created the following chart. The above market expectations are clearly similar to Greenspan's famous statement: Hikes will be at a "pace that's likely to be measured". The Yellen expected "pace" is half as often. The Yellen expected "measure" is half as much. Inquiring minds may wish to investigate my November 6, 2007 commentary on Greenspan's "measured pace", well ahead of the crisis: Greenspan on Housing, Central Bank, Gold. Even at the above half-pace, half-measure set of market expectations, I suggest we will not see many of those hikes. Instead, I propose the Fed delayed hikes so long, that an interim recession will gum up the works leaving the Fed no room to cut. My recession warning still stands.